INTRODUCTION: The high recurrence rate of conventional open repair in the treatment of ventral hernias has caused a paradigm shift in its treatment to the laparoscopic approach. 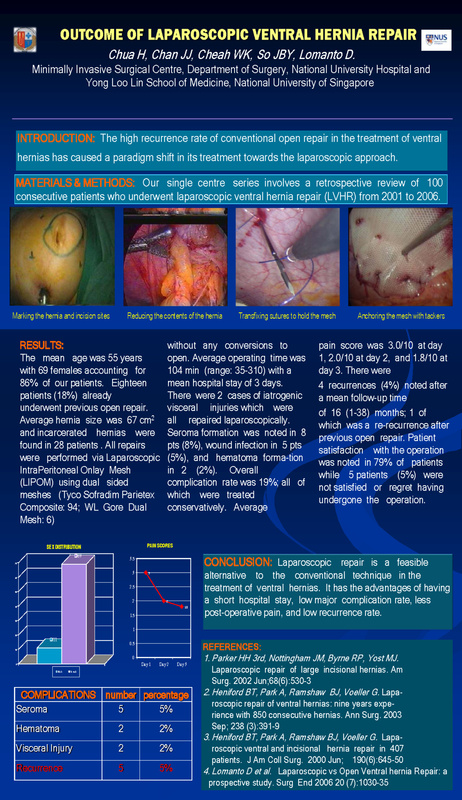 MATERIALS & METHODS: Our single centre series involves a retrospective review of 80 consecutive patients who underwent laparoscopic ventral hernia repair (LVHR) from 2001 to 2006. RESULTS: The mean age was 55 years with 69 females accounting for 86% of our patients. Fourteen patients (17.5%) already underwent previous open repair. Average hernia size was 67 cm2 and incarcerated hernias were found in 28 patients (35%). All repairs were performed via Laparoscopic Intra-Peritoneal Onlay Mesh (LIPOM) repair using dual sided meshes (Tyco Sofradim Parietex Composite : 74; WL Gore Dual Mesh: 6) with no conversions to open. Average operating time was 104 min (range: 35-310) with a mean hospital stay of 3 days. There were 2 cases of iatrogenic visceral injuries which were all repaired laparoscopically. Seroma formation was noted in 4 pts (5%), wound infection in 5 pts (6%), and hematoma formation in 2 (2.5%). Overall complication rate was 23.7%; all of which were treated conservatively. Average pain score was 3.0/10 at day 1, 2.0/10 at day 2, and 1.8/10 at day 3. There were 4 recurrences (5%) noted after a mean follow-up time of 16 (1-38) months; 1 of which was a re-recurrence after previous open repair. Patient satisfaction with the operation was noted in 79% of patients while 4 patients (5%) were not satisfied or regret the having undergone the operation. CONCLUSION: Laparoscopic repair is a feasible alternative to the conventional technique in the treatment of ventral hernias. It has the advantages of having a short hospital stay, low major complication rate, less post-op pain, and low recurrence rate.